CORS Filter is an implementation of W3C's CORS (Cross-Origin Resource Sharing) specification. CORS is a mechanism which enables cross-origin requests. CORS Filter work by adding required Access-Control-* headers to HttpServletResponse object. The filter also protects against HTTP response splitting. If request is invalid, or is not permitted, then request is rejected with HTTP status code 403 (Forbidden). 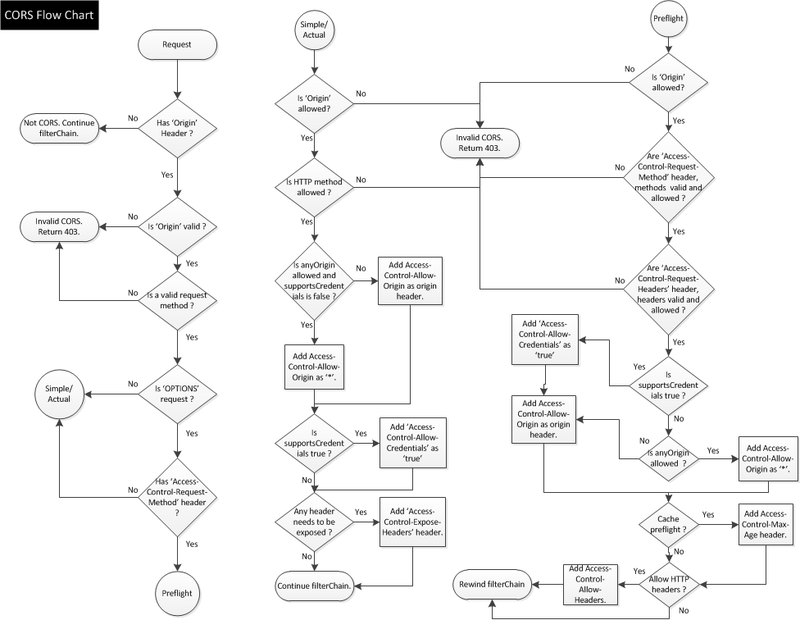 A flowchart that demonstrates request processing by this filter. The minimal configuration required to use CORS Filter is as below which is already added to the web.xml in oxauth.war. Below is only for reference and no additional action is required, and configuration steps are defined below. CORS Filter reads the configurations from LDAP and therefore configuration can be done in oxTrust UI directly. Filter Name for CORS Filter in Gluu CE will be org.xdi.oxauth.filter.CorsFilter. 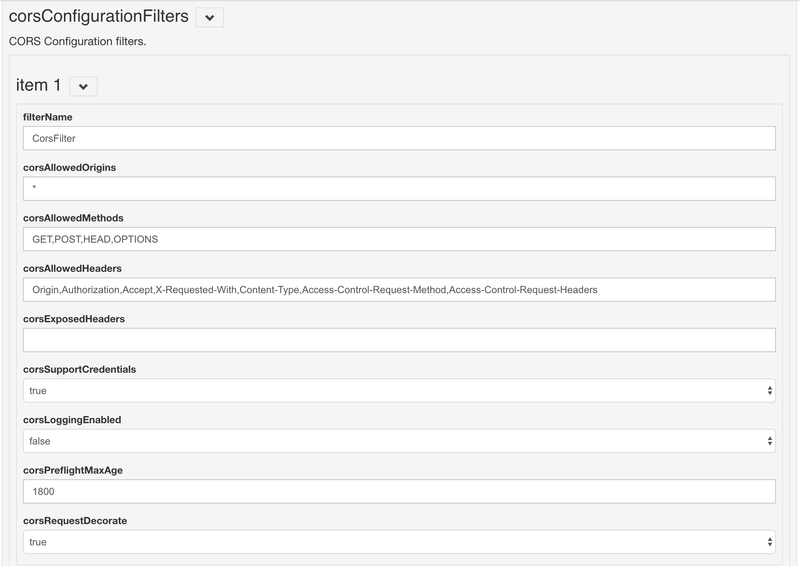 If corsConfigurationFilters is hidden or collapsed, click on the arrow to be expand. Once all the parameters are defined and configured, click on the save button at the end of the page. AA list of origins that are allowed to access the resource. A * can be specified to enable access to resource from any origin. Otherwise, a whitelist of comma separated origins can be provided. Eg: http://www.w3.org, https://www.apache.org. Defaults: * (Any origin is allowed to access the resource). A comma separated list of request headers that can be used when making an actual request. These headers will also be returned as part of Access-Control-Allow-Headers header in a pre-flight response. Eg: Origin,Accept. Defaults: Origin, Accept, X-Requested-With, Content-Type, Access-Control-Request-Method, Access-Control-Request-Headers.